From: 10.00 pm on Saturday 26 January 2008. To: 6.00 am on Sunday 27 January 2008. £15.00 (GBP : United Kingdom Pounds) . 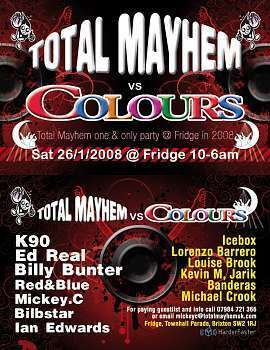 Colours and Total Mayhem start off 2008 with a bang.Londons 2 most uplifting parties join forces for a one off event at the world famous fridge nightclub in brixton, as always with these 2 promotions expect only the best in production with state of the art sound and lighting, backdrops, smoke machines, lasers, gloworm dancers, designated smoking area and much more. Brixton, South West, London, England, United Kingdom.